West Bromwich (/ˈbrɒmɪtʃ/ ( listen) BROM-itch) is a large market town and is one of the six amalgamated towns in the borough of Sandwell, West Midlands, England. 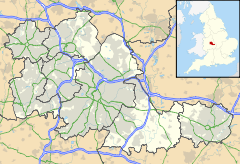 Historically part of Staffordshire, it is 6.4 miles (10.3 km) northwest of Birmingham. West Bromwich has a population of almost 78,000 in 2018. By the outbreak of World War I in 1914, many of the older houses built to house workers during the Industrial Revolution were becoming unfit for human habitation Sanitation was inadequate, decay was rife, and the homes were becoming a danger to the health and safety of their inhabitants. After the end of the war, the local council started building new homes to rehouse people from the rundown town centre. However, there are still many late 19th century and early 20th century buildings around the centre of West Bromwich. The town suffered significant air raid damage in World War II, with 58 civilian deaths, most in the raids of 19 November 1940 around Oak Road and Lombard Street to the west of the town centre. There were a few other less severe raids in the war on parts of West Bromwich including Stone Cross and Tantany, with no fatalities. This occurred on the same night as the Birmingham Blitz, which resulted in thousands of casualties, as well as the less severe raids on nearby Dudley and Tipton. The local road network was also massively improved during the 1960s and 1970s. West Bromwich is at the extreme northern end of the M5 motorway, and has had direct access to it since the early 1960s. This gave the town an immediate fast road link to faraway places including Worcester, Gloucester, Bristol and Exeter. Traffic passing through West Bromwich on the main route from Wolverhampton to Birmingham was diverted along the new dual carriageway, the Northern Loop Road (also known as The Expressway), after its opening in 1972, with another dual carriageway being built to link The Expressway with neighbouring Oldbury. 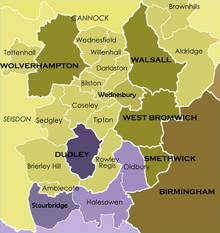 The town is divided into two constituencies; West Bromwich East and West Bromwich West. West Bromwich East is served by Tom Watson of Labour who was initially elected in 2001. Watson has been re-elected four times since, despite having a reduced majority at the 2010 general election. Preceding him was Peter Snape, also of Labour, who had been MP since the 1974 general election. The town is famous for its football club, West Bromwich Albion. The club was founded in 1878 and in 1888 it became one of the 12 founder members of the Football League. It won the league championship in 1920 and has won the FA Cup five times, most recently in 1968. 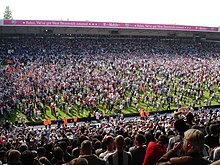 The club were Football League Champions in 2008, winning automatic promotion to the Premier League. Albion were based in and around the centre of West Bromwich during their formative years, but moved further out of the town in 1900 when they switched to their current ground, The Hawthorns. The Hawthorns is the highest football ground (above sea level) in the country. West Bromwich Manor House, Hall Green Road, was built by the de Marnham family in the late 13th century as the centre of their agricultural estate in West Bromwich only the Great Hall survives of the original complex of living quarters, agricultural barns, sheds and ponds. Successive occupants modernised and extended the Manor House until it was described in 1790 as "a large pile of irregular half-timbered buildings, black and white, and surrounded with numerous out-houses and lofty walls." The Manor House was saved from demolition in the 1950s by West Bromwich Corporation which carried out an extensive and sympathetic restoration of this nationally important building. A large portion of the town centre has been procured by Tesco for the development of a Tesco Extra store and shopping centre called New Square, West Bromwich which has been built on top of the old hospital. Since the early 2000s the tenants of homes and businesses have slowly moved out of the site to make way for the development. Cronehills Primary School (staff and pupils) relocated to the newly built Eaton Valley Primary School, which opened in September 2009. The police station relocated to a brand new building the other site of the ring road. Major works started on the site during October 2011 and the development was due to be complete by late spring 2013. The Church of England provides the most places of worship across the geographically wider West Bromwich Deanery (taking in West Bromwich, Hill Top, Stone Cross, Carter's Green, Holy Trinity, All Saint's, St Andrew's, St Francis, Friar Park and others) which contains nine Anglican churches. Other Christian denominations are present, including Roman Catholic, Seventh-day Adventist, Methodist, Baptist, Elim Pentecostal, Assemblies of God and other independent churches. The deanery of West Bromwich is under the Anglican Diocese of Lichfield. West Bromwich has four mosques. With two on Dartmouth street, one serving the Bangladeshi sunni community and the other, the Pakistani sunni community. The reason for the separate mosques is due to historic differences in opinions between imams of the berelvi community (Pakistani) and other sunni denominations. The largest mosque in West Bromwich is the Madinatul Uloon Al-Islamiyah Madrasa on Moor street which accommodates all muslim Sunni denominations and follows the Deobandi school of thought. The fourth mosque is a relatively new mosque which was opened in 2016 and follows the Bangladeshi fultoli teachings. The Bangladeshi mosque on Dartmouth street (the Jami Masjid and Islamic Centre) is currently fundraising to rebuild a purpose built mosque to accommodate more worshippers. Currently, they have obtained the land they require for this rebuild but are lacking crucial funding required for the ambitious multi-million pound rebuild. The Jami Masjid and Islamic Centre was the first mosque in the area, of Bangladeshi origin. Madinatul Uloom Al-Islamiyah, located at Moor street is based at an abandoned church and was converted into a functioning mosque in 2001. The mosque also functions as a madrasa, meaning that it offers taught classes and hosts Islamic events including an annual jalsa (Islamic gathering). It currently (and since 2003) offers Islamic evening classes to hundreds of children and has plans in the future to offer higher education to adults who desire to pursue Islamic studies at a higher level. The premises consists of two large prayer halls and an assortment of classrooms. This mosque is regularly attended by mostly people of Bangladeshi, Pakistani and Arab ethnicity (in order of proportions of worshippers from each ethnicity) - but what sets this mosque apart from others in West Bromwich, is that it is used regularly by people of many ethnicities, unlike other mosques in West Bromwich which are primarily used by people of one ethnicity. There are also a large[vague] number of Sikhs in the area. There are many Gurudwaras. Sikhs have settled in the area since 1950, when the first influx of immigrants came. The oldest Gurdwara in West Bromwich is the Gurdwara Guru Har Rai Sahib Ji on High Street. Other Gurdwara's include Guru Nanak Gurdwara on Edward Street and Gurdwara Sachkhand Ishar Darbar on Vicarage Road. West Bromwich railway station was opened by the Great Western Railway on its route between Birmingham Snow Hill and Wolverhampton Low Level on 14 November 1854. The trackbed of that line is now served by the Midland Metro light rail (tram) system giving West Bromwich 7 tram stops: The Hawthorns tram stop, Kenrick Park tram stop, Trinity Way tram stop, West Bromwich Central tram stop, Lodge Road West Bromwich Town Hall tram stop, Dartmouth Street tram stop and Dudley Street Guns Village tram stop. The nearest main-line railway station is now Sandwell & Dudley railway station, approximately 1 mile (2 km) away in Oldbury town centre. Though services to Stourbridge Junction, Worcester Shrub Hill, Worcester Foregate Street, and Birmingham Snow Hill, Birmingham Moor Street call at The Hawthorns railway station. There was previously a Newton Road railway station on Newton Road which was located a mile away from the town centre. It was on the Grand Junction Railway that ran from Birmingham New Street to Stafford via Wolverhampton High Level and Walsall. This station closed in 1945 although it moved two times between 1863 and 1902, only the line remains in use for the services from Walsall to Birmingham, Wolverhampton and Liverpool Lime Street. The nearest airport which is approximately 16 miles (26 km) away, is Birmingham Airport, which can be reached by tram to Birmingham New Street and train to Birmingham International. West Bromwich has a large bus station managed by Transport for West Midlands (previously Centro) and served by a large number of routes, both locally to places such as Oldbury, Smethwick and Stone Cross as well as regional bus routes to places such as Birmingham, Wolverhampton and Walsall. Stands are lettered a through to z. The main bus operators serving the bus station are National Express West Midlands and Diamond Bus. The town is served by five secondary schools: George Salter Academy, Health Futures UTC, the Phoenix Collegiate, Q3 Academy and Sandwell Academy. A new secondary school, West Bromwich Collegiate Academy, will open in September 2019. The town has 21 primary schools in total. Some of which are Lodge Primary School, St. John Bosco RC Primary School,Ryders Green Primary School, All Saints' CofE Primary School, St Mary Magdalene, Hateley Heath and Eaton Valley. The town's sport scene is dominated by West Bromwich Albion, a football club who were founded in the town in 1878 and played at a stadium near the town centre until they moved to their current home, The Hawthorns on Birmingham Road (on the borders of Smethwick and Handsworth) in 1900. All traces of the original structures are long gone; the oldest stand is the Halfords Lane Stand that was built in 1979 and the other three stands were built between 1991 and 2001. In 2008 the Halfords Lane Stand was refurbished and is now called the West Stand. West Brom were among the 12 founder members of the Football League in 1888, along with their two fiercest local rivals, Aston Villa and Wolverhampton Wanderers. The club has won seven major trophies; five FA Cups, one Football League title and one Football League Cup. Their most recent major trophy came in 1968 when they won the FA Cup with a 1–0 win over Everton at Wembley Stadium. They enjoyed further success in the late 1970s and early 1980s, when they finished in the top five league positions three times in four seasons as well as reaching a UEFA Cup quarter-final. They currently play in the EFL Championship, the second tier of English football, having been relegated from the Premier League in May 2018.
Notable former players of West Bromwich Albion include Ronnie Allen (who later had two spells as the club's manager), Bryan Robson (who was also later the club's manager), Laurie Cunningham (the first black player to play for the senior England national team, but died in 1989 at age 33), Tony Brown (the club's all-time leading goalscorer) and Jeff Astle (who scored the club's winning goal in the 1968 FA Cup Final and remained a cult figure among Albion fans). The local cricket team is West Bromwich Dartmouth Cricket Club and is based in the town, very near to the Hawthorns. Miles Storey – footballer currently playing for Partick Thistle. ^ "Census 2018 Key Stats". Sandwell Trends. Sandwell Metropolitan Borough Council. Retrieved 2 July 2013. ^ a b "Census 2001 Key Statistics, Urban areas in England and Wales". Office for National Statistics. Retrieved 2 July 2013. ^ Cite error: The named reference https://www.citypopulation.de/php/uk-england-westmidlands.php?cityid=E35001491 was invoked but never defined (see the help page). ^ "West Bromwich: Churches – British History Online". www.british-history.ac.uk. ^ GENUKI. "Genuki: West Bromwich, Staffordshire". www.genuki.org.uk. ^ a b c "West Bromwich: Parliamentary history – British History Online". www.british-history.ac.uk. ^ a b "West Bromwich: The growth of the town – British History Online". www.british-history.ac.uk. ^ "Queen's Square Shopping Centre". ^ Group, Completely. "Kings Square Sandwell Centre, West Bromwich – Completely Retail". www.completelyretail.co.uk. ^ "£5m revamp for West Bromwich shopping centre". www.expressandstar.com. ^ "A little extra help". ^ "Masked youths rampage through West Bromwich". www.expressandstar.com. ^ "The Guardian: West Bromwich East". ^ "The Guardian: West Bromwich West". ^ "The Guardian: West Bromwich West full election history". ^ "Weatherbase.com". Weatherbase. 2013. Retrieved on 4 June 2013. ^ "History of West Bromwich, in Sandwell and Staffordshire – Map and description". www.visionofbritain.org.uk. ^ Haywood, Bob (19 May 2013). "Investors in The Public could be set to sue". Birmingham Mail. ^ TheThemeLab. "Shree Krishna Temple – West Bromwich". www.skm-wb.org. ^ "West Bromwich: Hindus – British History Online". www.british-history.ac.uk. ^ "Those were the days". www.expressandstar.com. ^ "Pleasant Sunday Afternoon – The Black Country Society". 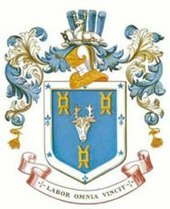 www.blackcountrysociety.co.uk. ^ West Bromwich at Post War English & Scottish Football League A–Z Player's Database. Retrieved 8 February 2018. ^ Dan Wooding (6 August 2010). "The next chapter in the extraordinary life of Cindy Kent". Christian Today. Retrieved 9 October 2018.